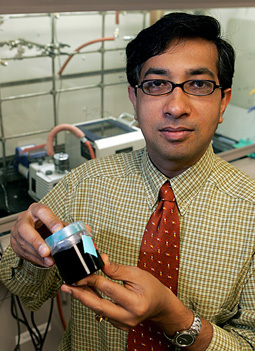 Ramanan Krishnamoorti, associate professor of chemical engineering, received the Excellence in Research and Scholarship Award for the associate professor rank. Since joining the faculty in 1996, Krishnamoorti has worked and interacted with the very best people in the field of polymer research and brings a high level of skill to these collaborations. “He has set his professional sights very high and has an open vision of science and engineering and has grown in stature with both time and experience,” said one supporter of Krishnamoorti’s nomination for the award. “I would like to express my sincere gratitude to all of my undergraduate and graduate students and post-doctoral researchers whose research work is being honored by this award,” Krishnamoorti said. Awards are given each year to three faculty members who have achieved a substantial record of outstanding research, scholarship or creative activities in their field. Each award carries a $3,000 stipend and a plaque.